There are many exciting new technologies that will continue to transform the world and improve human welfare. 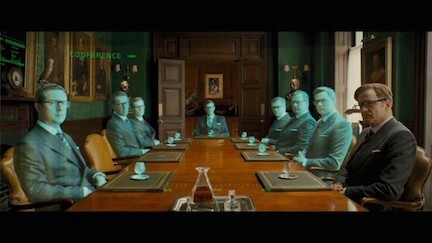 Here are eleven of them. Self-driving cars exist today that are safer than human-driven cars in most driving conditions. Over the next 3–5 years they‘ll get even safer, and will begin to go mainstream. The World Health Organization estimates that 1.25 million people die from car-related injuries per year. Half of the deaths are pedestrians, bicyclists, and motorcyclists hit by cars. Cars are the leading cause of death for people ages 15–29 years old. Just as cars reshaped the world in the 20th century, so will self-driving cars in the 21st century. In most cities, between 20–30% of usable space is taken up by parking spaces, and most cars are parked about 95% of the time. 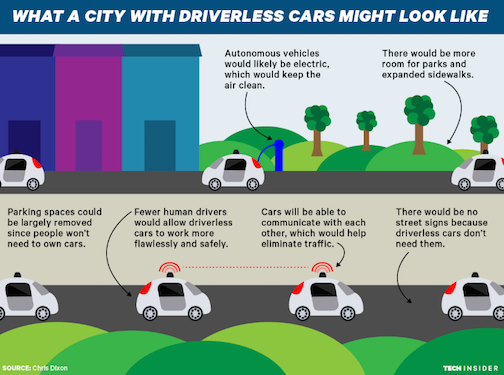 Self-driving cars will be in almost continuous use (most likely hailed from a smartphone app), thereby dramatically reducing the need for parking. Cars will communicate with one another to avoid accidents and traffic jams, and riders will be able to spend commuting time on other activities like work, education, and socializing. Attempts to fight climate change by reducing the demand for energy haven’t worked. Fortunately, scientists, engineers, and entrepreneurs have been working hard on the supply side to make clean energy convenient and cost-effective. Due to steady technological and manufacturing advances, the price of solar cells has dropped 99.5% since 1977. Solar will soon be more cost efficient than fossil fuels. The cost of wind energy has also dropped to an all-time low, and in the last decade represented about a third of newly installed US energy capacity. Forward thinking organizations are taking advantage of this. 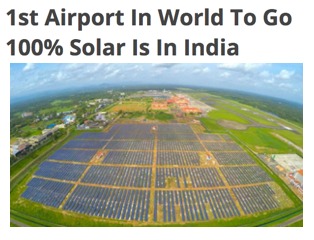 For example, in India there is an initiative to convert airports to self-sustaining clean energy. Tesla is making high-performance, affordable electric cars, and installing electric charging stations worldwide. There are hopeful signs that clean energy could soon be reaching a tipping point. For example, in Japan, there are now more electric charging stations than gas stations. And Germany produces so much renewable energy, it sometimes produces even more than it can use. 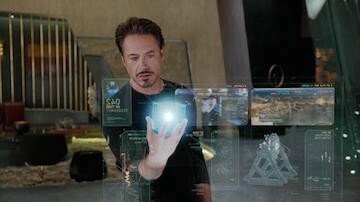 Computer processors only recently became fast enough to power comfortable and convincing virtual and augmented reality experiences. Companies like Facebook, Google, Apple, and Microsoft are investing billions of dollars to make VR and AR more immersive, comfortable, and affordable. VR and AR have been dreamed about by science fiction fans for decades. In the next few years, they’ll finally become a mainstream reality. GPS started out as a military technology but is now used to hail taxis, get mapping directions, and hunt Pokémon. Likewise, drones started out as a military technology, but are increasingly being used for a wide range of consumer and commercial applications. 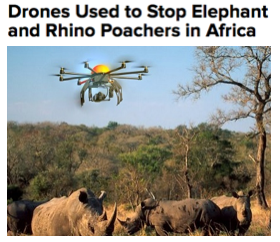 For example, drones are being used to inspect critical infrastructure like bridges and power lines, to survey areas struck by natural disasters, and many other creative uses like fighting animal poaching. Amazon and Google are building drones to deliver household items. 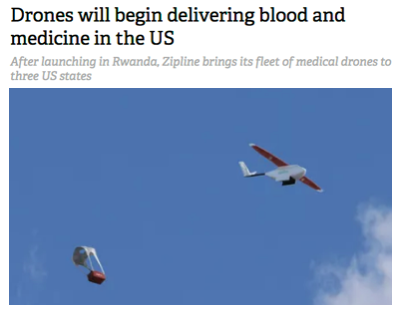 The startup Zipline uses drones to deliver medical supplies to remote villages that can’t be accessed by roads. There is also a new wave of startups working on flying cars (including two funded by the cofounder of Google, Larry Page). Flying cars use the same advanced technology used in drones but are large enough to carry people. Due to advances in materials, batteries, and software, flying cars will be significantly more affordable and convenient than today’s planes and helicopters. Artificial intelligence has made rapid advances in the last decade, due to new algorithms and massive increases in data collection and computing power. Google built an AI system that controls its datacenter power systems, saving hundreds of millions of dollars in energy costs. The broad promise of AI is to liberate people from repetitive mental tasks the same way the industrial revolution liberated people from repetitive physical tasks. Some people worry that AI will destroy jobs. History has shown that while new technology does indeed eliminate jobs, it also creates new and better jobs to replace them. 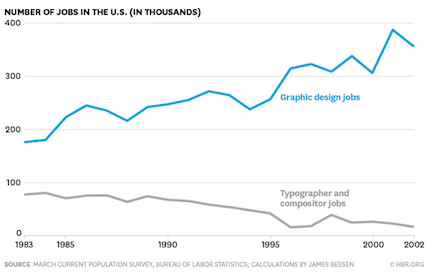 For example, with advent of the personal computer, the number of typographer jobs dropped, but the increase in graphic designer jobs more than made up for it. It is much easier to imagine jobs that will go away than new jobs that will be created. Today millions of people work as app developers, ride-sharing drivers, drone operators, and social media marketers— jobs that didn’t exist and would have been difficult to even imagine ten years ago. 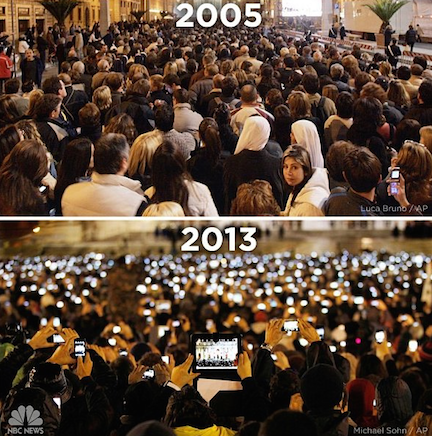 By 2020, 80% of adults on earth will have an internet-connected smartphone. An iPhone 6 has about 2 billion transistors, roughly 625 times more transistors than a 1995 Intel Pentium computer. Today’s smartphones are what used to be considered supercomputers. Protocols are the plumbing of the internet. Most of the protocols we use today were developed decades ago by academia and government. Since then, protocol development mostly stopped as energy shifted to developing proprietary systems like social networks and messaging apps. Protocols based on blockchains also have capabilities that previous protocols didn’t. For example, Ethereum is a new blockchain-based protocol that can be used to create smart contracts and trusted databases that are immune to corruption and censorship. While college tuition skyrockets, anyone with a smartphone can study almost any topic online, accessing educational content that is mostly free and increasingly high-quality. Encyclopedia Britannica used to cost $1,400. Now anyone with a smartphone can instantly access Wikipedia. You used to have to go to school or buy programming books to learn computer programming. Now you can learn from a community of over 40 million programmers at Stack Overflow. YouTube has millions of hours of free tutorials and lectures, many of which are produced by top professors and universities. The quality of online education is getting better all the time. For the last 15 years, MIT has been recording lectures and compiling materials that cover over 2000 courses. As perhaps the greatest research university in the world, MIT has always been ahead of the trends. Over the next decade, expect many other schools to follow MIT’s lead. Earth is running out of farmable land and fresh water. This is partly because our food production systems are incredibly inefficient. 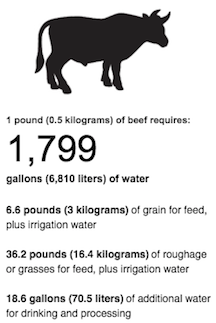 It takes an astounding 1799 gallons of water to produce 1 pound of beef. Fortunately, a variety of new technologies are being developed to improve our food system. For example, entrepreneurs are developing new food products that are tasty and nutritious substitutes for traditional foods but far more environmentally friendly. The startup Impossible Foods invented meat products that look and taste like the real thing but are actually made of plants. Their burger uses 95% less land, 74% less water, and produces 87% less greenhouse gas emissions than traditional burgers. Other startups are creating plant-based replacements for milk, eggs, and other common foods. Soylent is a healthy, inexpensive meal replacement that uses advanced engineered ingredients that are much friendlier to the environment than traditional ingredients. Some of these products are developed using genetic modification, a powerful scientific technique that has been widely mischaracterized as dangerous. According to a study by the Pew Organization, 88% of scientists think genetically modified foods are safe. 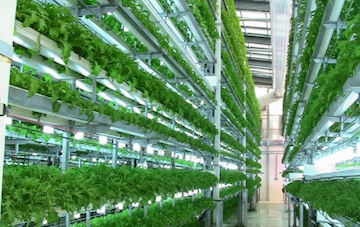 Another exciting development in food production is automated indoor farming. Due to advances in solar energy, sensors, lighting, robotics, and artificial intelligence, indoor farms have become viable alternatives to traditional outdoor farms. Compared to traditional farms, automated indoor farms use roughly 10 times less water and land. Crops are harvested many more times per year, there is no dependency on weather, and no need to use pesticides. Until recently, computers have only been at the periphery of medicine, used primarily for research and record keeping. Today, the combination of computer science and medicine is leading to a variety of breakthroughs. 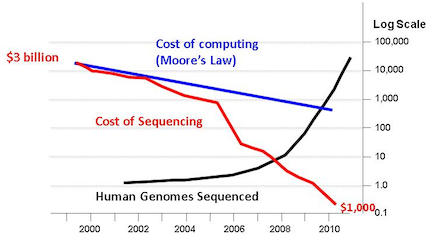 For example, just fifteen years ago, it cost $3B to sequence a human genome. Today, the cost is about a thousand dollars and continues to drop. Genetic sequencing will soon be a routine part of medicine. Genetic sequencing generates massive amounts of data that can be analyzed using powerful data analysis software. One application is analyzing blood samples for early detection of cancer. Further genetic analysis can help determine the best course of treatment. Soon we’ll have the technology to control prothetic limbs with just our thoughts using brain-to-machine interfaces. Computers are also becoming increasingly effective at diagnosing diseases. An artificial intelligence system recently diagnosed a rare disease that human doctors failed to diagnose by finding hidden patterns in 20 million cancer records. Since the beginning of the space age in the 1950s, the vast majority of space funding has come from governments. But that funding has been in decline: for example, NASA’s budget dropped from about 4.5% of the federal budget in the 1960s to about 0.5% of the federal budget today. 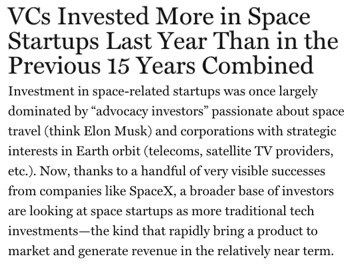 The good news is that private space companies have started filling the void. These companies provide a wide range of products and services, including rocket launches, scientific research, communications and imaging satellites, and emerging speculative business models like asteroid mining. The most famous private space company is Elon Musk’s SpaceX, which successfully sent rockets into space that can return home to be reused. Perhaps the most intriguing private space company is Planetary Resources, which is trying to pioneer a new industry: mining minerals from asteroids. 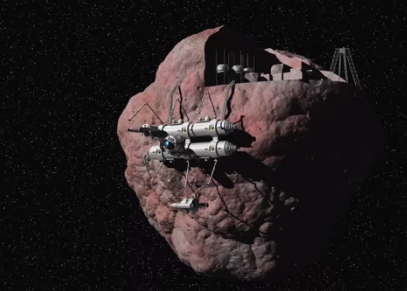 If successful, asteroid mining could lead to a new gold rush in outer space. Like previous gold rushes, this could lead to speculative excess, but also dramatically increased funding for new technologies and infrastructure.